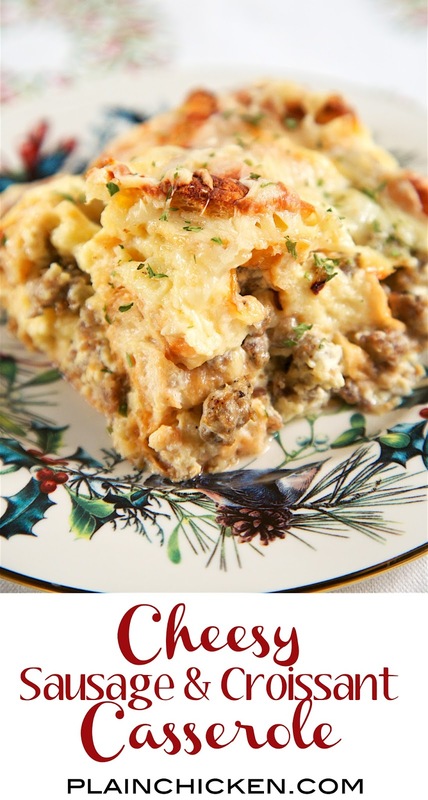 Overnight Cheesy Sausage and Croissant Casserole - buttery croissants, sausage, eggs, heavy cream and gruyere cheese - make and refrigerate overnight. SO delicious!! 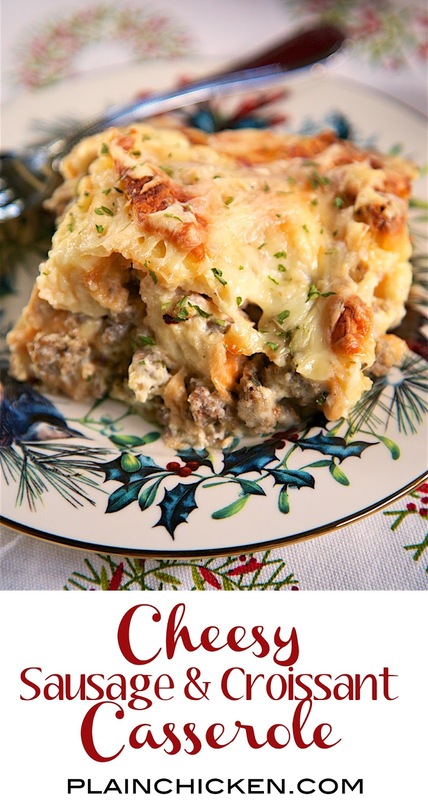 Great casserole recipe for Christmas morning! 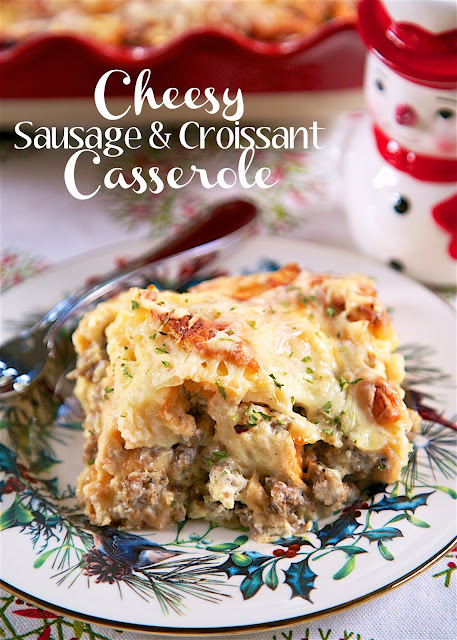 I can't get enough of this delicious Cheesy Sausage and Croissant Casserole. It has all of our favorite things in it - buttery croissants, sausage and cheese. Lots of amazing Gruyere cheese! The Gruyere tasted amazing and melted beautifully on top of the casserole. If you don't want the expense of Gruyere cheese, you can definitely substitute swiss. Heck, use whatever cheese if your favorite! Gouda, cheddar, Monterey jack. They will all taste great! 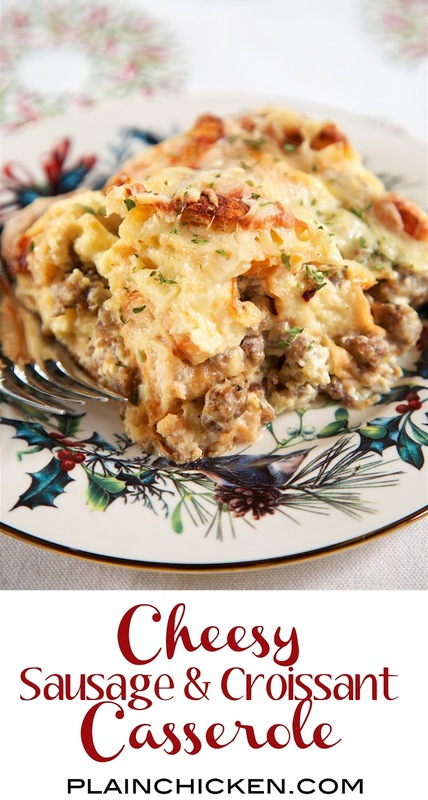 The best part about this casserole is that it can be made ahead of time and refrigerated overnight. Perfect for Christmas morning!! Cook sausage in skillet over medium-high heat until done. Remove from skillet and drain fat. Toss together cooked sausage, Parmesan cheese, onion powder and chopped croissants. Pour into a lightly greased 9x13-inch pan. Whisk together milk, heavy cream and eggs. Pour over sausage mixture. Cover and refrigerate 8 hours. Preheat oven to 350ºF. 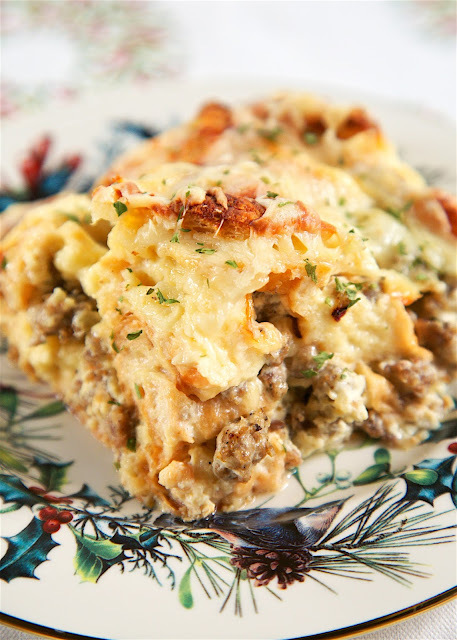 Uncover casserole and top with shredded Gruyere cheese. Bake 45 minutes or until golden brown. Let stand 10 minutes before serving. Will be making this during Christmas. Thank you for sharing. Do you bake straight from the fridge or let it reach room temp before baking? I baked it straight from the fridge. I let it sit out while the oven preheated. Check it at 45 minutes. It might need 5 minutes more baking time - depending on your oven. Thank you for the clarification! Merry Christmas! I'm not sure - the chopped croissants filled up the 9x13-inch pan. We will be having a Plain Chicken Christmas morning. I have prepared this along with your chocolate croissant bake. Can't wait to try it in the morning! Merry Christmas! Great choices! Enjoy!! Merry Christmas!!! I sent this to my mom and she made it for this morning... It was amazing! Merry Christmas! YAY!! SO glad to hear it was a hit! Merry Christmas! Are these refrigerated dough pills bury croissants or already made? When you said ask the bakery it makes think these are already made croissants? Already made croissants. Not crescent rolls.